Today I want to share a quick idea that I started doing with my class this year...REVIEW SHEETS! You may be thinking... "duh, tons of teachers use review sheets!" And yes, you would be correct. Many teachers hand out review sheets before test day so that the kiddos know what to focus on when preparing for the test. on the day that we START the unit! (they are always green for science and yellow for social studies). Then as we go through the chapter each day, we fill in the definitions, answer short answer questions, and label diagrams on the review sheet. The day before a quiz, I have the students highlight key information that needs to be studied. Then, by the end of the unit, they have filled out the review sheet and have only to go home and review what they've already written down. The completed review sheet is turned in on test day as a completion grade. Voila! A simple, easy-to-implement strategy that keeps the information fresh and relevant throughout the unit - plus it cuts down on my kiddos feeling panicky and cramming the night before the test. What have you TRIED recently? 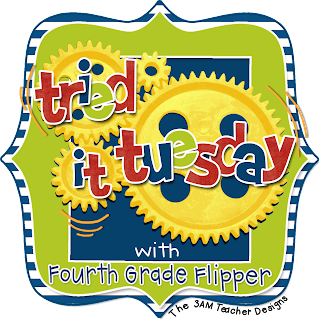 Link up your tips and tricks with Holly over at Fourth Grade Flipper!